Danbury CT: There was music in the air for the third year in a row and smiles everywhere last weekend, Saturday, July 26 and Sunday, July 27, 2014 at Liverpool Productions' "Danbury Fields Forever lll" Fab 4 Music & Arts Festival, where some 20 acts played Beatles and solo songs for a crowd of over three thousand fans from all over the East Coast at Danbury, Connecticut’s beautiful Ives Concert Park. The gates opened at noon, and Chuck Lore, aka "Charlie Guitar," started off the festival with his breezy versions of Beatle and solo classics on guitar. The virtuoso had been the only artist to play all four evenings of "NYC FAB 50" in February, and he opened the festival beautifully as attendees made their way to their seats or opened blankets or folding chairs out in the lawn areas. Ken Theroux of RewoundRadio.com was the event’s MC and he welcomed the acts while eloquently interspersing Beatles trivia throughout the day. The star students of New Canaan, CT's "School of Rock" followed Charlie Guitar and they wowed the crowd with their maturity and professionalism. Their song selection was spot-on and their performance further warmed up the crowd. One of the British Invasion's founding fathers, Karl Green, bassist and one of the founding members of Herman's Hermits, was the festival's Special Guest of Honor, and he greeted the crowd from the stage before taking a seat in the vendor's section to meet and greet fans. A warm, funny and friendly guy with a huge heart, Karl signed autographs, posed for photos and mingled with guests for about 2 hours (with thanks to friends Mike and Connor) as hard-rockin' Pat Horgan & Thunder Road played their rollicking set. As a tribute to Karl Green, Pat's band ended their set of Beatle and solo rockers with a surprise non-Beatle nugget, "I'm Henry the VIII (I Am)." It was also a great ending to a stellar set from the band. Former Beatlemania cast-member Pete Santora was the first of several solo tribute performers, with an all-Harrison seamless set that consisted of Here Comes the Sun, Something, Any Road, I Need You, My Sweet Lord, All Too Much, Isn't It a Pity. 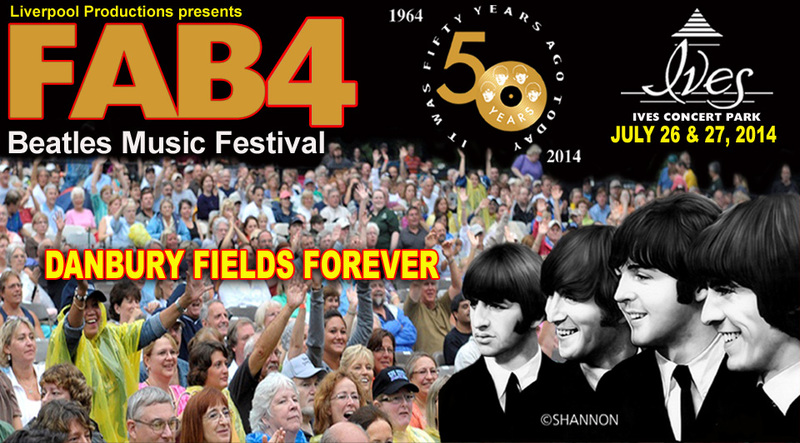 I, Mayor Mark D. Boughton, do hereby issue this Proclamation in honor of The DANBURY FIELDS FOREVER Fab 4 Music Festival at Ives Concert Park, 43 Lake Ave. Extension, Danbury, CT, in celebration of the 50th Anniversary of The Beatles coming to America and their legendary music. Fools On The Hill" came on next. The Milford, CT group were one of only t wo bands who had played the festival every year prior. The band's leader, Sal Grillo, lead the band through a nice mix of crowd-pleasers including All My Loving, I Call Your Name, Boys, Can't Buy Me Love, Yesterday, I've Just Seen A Face, Ballad of John and Yoko and Hey Jude. A portable playscape,interactive hula-hoop display and a variety of art exhibits and food vendors kept the young ones entertained, while the bands played on. Genetic Control from the Bronx, NY are the only other band who had performed at the previous two Danbury Fields Forever festivals. Once again they delivered heavy rock versions from The Beatles’ catalogue, highlighted by a Joe Cocker meets Ringo meets Led Zeppelin version of “With a Little Help From My Friends.” Everyone agreed that they should always be invited back to be part of the festival. Beatlehead, formerly The Aardvarks, were one of the surprise hits of the weekend. With a tight set and a female lead singer, the band machine-gunned though Sgt. Pepper, Back in the USSR, The Night Before, For You Blue, Dear Prudence, Hello Goodbye, Day Tripper and Don't Let Me Down. One of the festival wild-cards (because few had seen the act or had heard of them prior), they were a delightful addition to a roster with so many veteran acts. That paved the way for another non-vet band, Studio Two, a young, energetic group from New Hampshire, who won over the crowd instantly. They exploded out like the Savage Young Beatles with material from the Cavern, BBC and Hamburg days but with the polish of the Brian Epstein-managed MopTops. Reminiscent of a young 1964 The Tribute, with skinny ties and great vocals, the band poised themselves to be future festival headliners. There was immediate talk and speculation that the producers would discuss Studio Two to be invited to Liverpool's BeatleWeek in 2015. From newer back to veteran, The Oh Nos took to the stage with great fan fare. Having starred at the annual HarriFest, the group was well known to many of the New Englanders at the festival, and they rose to the occasion with their amazing solo selections, plus some other group surprises. The Oh Nos, from Massachusetts, finally appeared at the festival after being invited and not being able to make it for two years prior. Their set was a powerhouse combination of rarities and solo songs. And now it was time for the dress-up “boots & suits” band. Returning by popular demand, it was the Ed Sullivan Show brought back to life in the form of The Hofners, who once again had the audience in the palm of their hands – singing and dancing on their feet. Expectations were high for The Hofners after they headlined last year's event, and they expertly covered the early Beatles hits to the crowd’s complete satisfaction in celebration of the 1964-2014 50th Anniversary Celebration. Fronted by famed Beatles drummer Mike “Ringo” Streeto, The Hofners played hit after hit and followed their set by joining the audience for a photo op to close out day one of Danbury Fields Forever. An after-party with singalong and DJ music ended the night at the nearby Maron Hotel. Day two began with welcome comments from MC Ken Michaels of the "Every Little Thing" radio show, WNHU-FM radio and www.KenMichaelsRadio.com, and an introduction of another class of School of Rock, this time from Bedford/Westchester. They held their own against the pro bands with a FABulous rendering of Abbey Road's side two medley (even including "Her Majesty"). Sunday's Special Guest of Honor, rock & roll vocalist Ian Lloyd, was both guest and performer, as his band delivered their versions of If I Needed Someone, Please Please Me, She Loves You, From Me to You, No Reply and Help before surprising the crowd with Ian's own mega-hit Brother Louie from when he was lead singer in The Stories. It's also the theme song of the TV hit "Louie." After his hot set, Ian went to the vendor's area to meet fans and sign autographs. There was another special segment at this point, as the winners of the StarOnTheWeb.com online talent-search competition got to perform as part of their prizes. One very funny comedian, Beecher, had the crowd laughing before he brought on three amazingly talented singers, Kelly Tamale, Arlene Wow and Chelsea Hebert, who all could have been first place winners in any national singingcompetition. Paul McCartney was next up. Well, not really Paul but an incredible simulation in the form of lookalike Mike Miller and his tribute band "One Sweet Dream." They squeezed in solo Macca, Wings and songs that Paul sang in The Beatles. On drums was the multi-talented Jeffrey DiCera, who moved on to keyboards for the next act. Unannounced but incredibly appreciated was a super-group which featured some of the members of Ian Lloyd's band, bassist Gary Von Scyoc (who played with John Lennon in Elephant's Memory) and the lead guitar of Shannon. Yes Shannon! It should be noted that Shannon's presence and art was a huge part of the festival. Not only did her artwork grace the promo materials for the Fab 4 Music Festival, not only did she have a great display in the vendors area, and not only were giant murals adorning the festival site, but Shannon even played on stage - and rocked the crowd with While My Guitar Gently Weeps. She is a true artist in every sense of the word. Ken Michaels kept the crowd entertained with anecdotes and introduced AfterFab, a band similar in material to The Oh Nos. With string musicianship and a solid lead singer, they quickly proved that they were one of the best post-Beatles bands around. AfterFab machine-gunned though solo Beatle tunes, ending with New York City and winning over new fans along the way. True veterans of venues large and small, Norwalk, CT's The Way-Back Machine is a sixties music machine who entertained with a set consisting of Bad To Me, I'll Keep You Satisfied, You Can't Do That, I'm A Loser, Run For Your Life, A Hard Days Night, I Feel Fine and Twist and Shout. It would be a treat seeing this tight band do all their sixties in a venue where they would be playing multiple sets. Adorned in full Sgt Pepper outfits, Connecticut's The Mystery Tour returned for a second straight year with a set of Pepper, Mystery Tour and latter-day Beatle favorites. They were one of only four dress-up bands over the two days, and their show was a clear crowd-pleaser. The Lennon Legacy Show, a moving and spot-on tribute to John presented by Dave Pal from upstate New York, was a fine companion to the previous Harrison & McCartney tributes. With Lennon specs and army jacket, the singer/guitarist not only looked like John but sounded just like him. The crowd was mesmerized. Dave Pal would return to the stage soon with the closing act. Another band that was invited to the festival but couldn't play until this year was Rotary from central/northern CT. One of the highlights of the 2010 BeatExpo convention, Rotary aren't a Beatles band per se, they are simply a great rock and roll band who play Beatles. The audience wanted them to play more, as they did some of the other bands over the two days, but there were 10 acts to fill each day and one still hadn't played yet. The national touring show Beatlemania Again closed the historic festival with their faithful recreation of the MopTops circa 1964. With all the Ed Sullivan Show songs and the great memories of fifty years prior, it was a classic closing to an amazing musical celebration. Fans left Ives Concert Park commenting on how great the two days were, while looking forward to next year's festival.